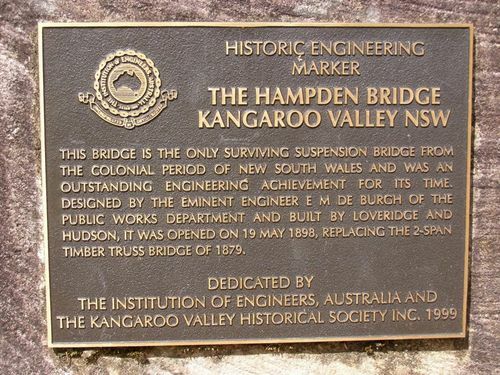 An Historic Engineering Plaque commemorates the Hampden Bridge. 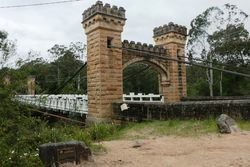 THIS BRIDGE IS THE ONLY SURVIVING SUSPENSION BRIDGE FROM THE COLONIAL PERIOD OF NEW SOUTH WALES AND WAS AN OUTSTANDING ENGINEERING ACHIEVEMENT FOR ITS TIME. 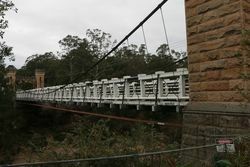 DESIGNED BY THE EMINENT ENGINEER E M DE BURGH OF THE PUBLIC WORKS DEPARTMENT AND BUILT BY LOVERIDGE AND HUDSON, IT WAS OPENED ON 19 MAY 1898, REPLACING THE 2-SPAN TIMBER TRUSS BRIDGE OF 1879.